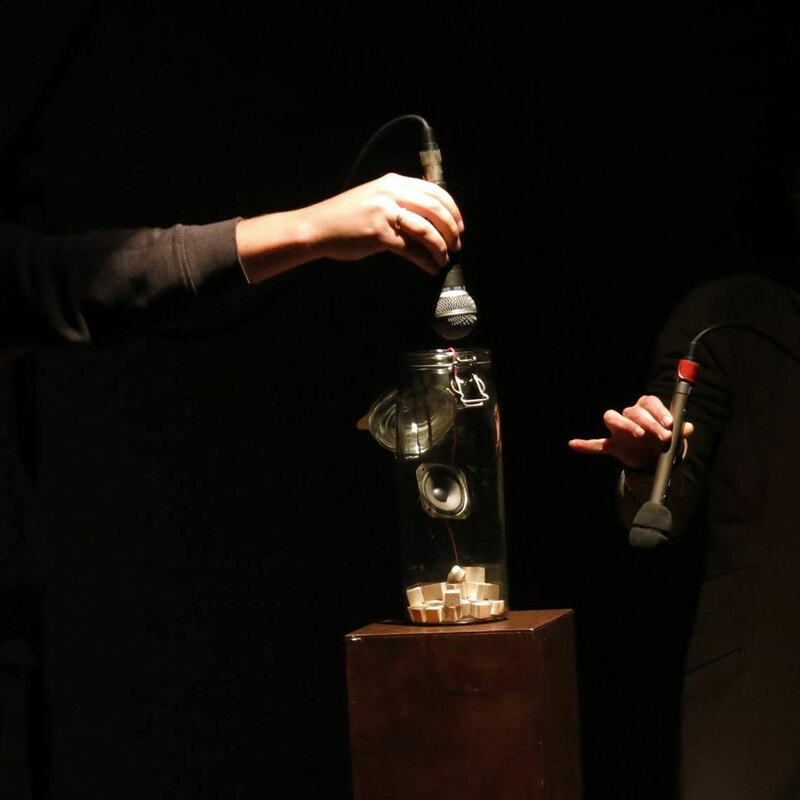 In Sound in a Jar (2016) by Ronald Boersen three performers— Ronald Boersen himself, Dganit Elyakim and Hadas Pe’ery—move three different microphones back and forwards to a very small loudspeaker placed in a jar. As Ronald explained me, this piece is a sound environment, which changes and developes algorithmically during the performance. The main task for the performers during the rehearsals is to explore this environment and find ways to engage musically with the sounds they can produce. The performers pick up the sounds of the loudspeaker in the small jar and it is sent back to the loudspeaker again, passing through a patch in the music software Max. 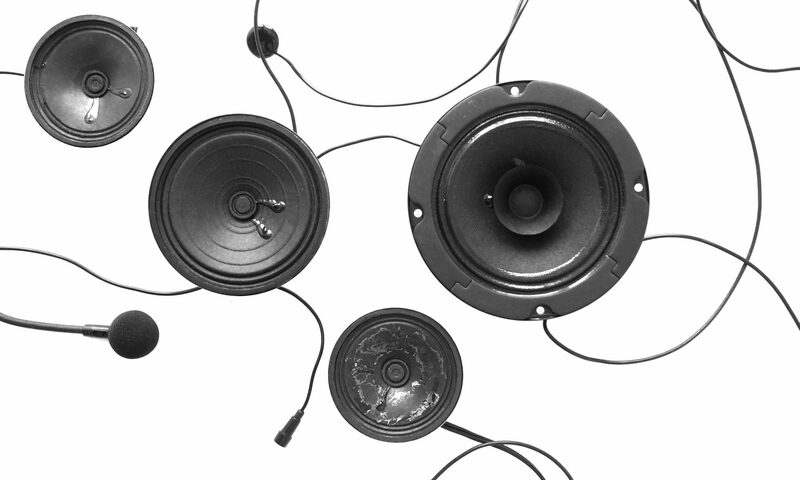 By placing the loudspeaker in a jar, the sound will resonate easier, a very suitable feature for acoustic feedback. The main sound of the performance is thus acoustic feedback, coloured by the different characteristics of the three microphones used (two different condenser and a dynamic microphone). The Max patch processes this feedback sound: as the scheme depicts, Ronald uses threshold triggered reverb pulses, feedback interval driven harmonisation and granular delay lines. By using amplitude thresholds and feedback frequencies these processes are directly influenced by the feedback sound itself, and the feedback itself is processed by the Max patch. 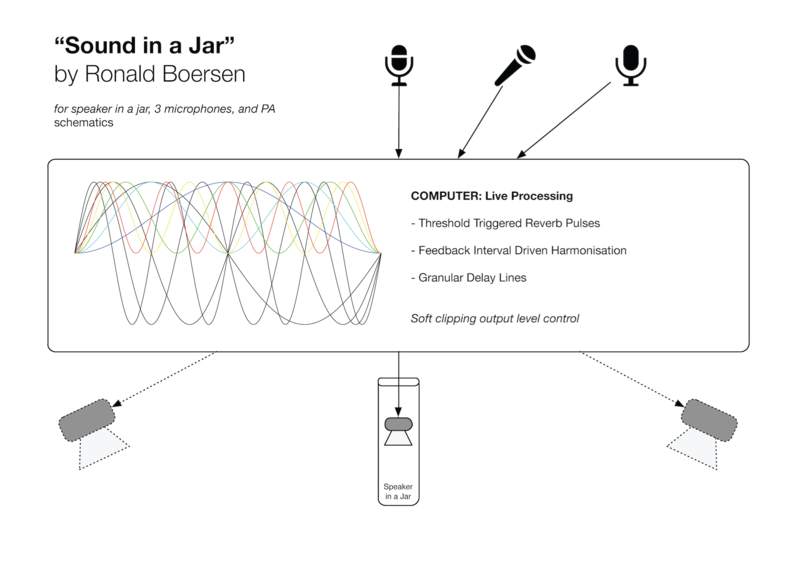 In this manner Sound in a Jar uses a double form of feedback: acoustic feedback (using the sound itself) and data feedback (by using data streams generated from amplitude and frequency analyses of the loudspeaker sound, without using the sound itself), and both are effecting each other constantly. How much the sound of each microphone is processed by Max and which of the three processes is used (reverb pulses, harmonisation or granular delay) is changing during the piece, as is depicted in the diagram in the score. The relationships between microphone, processing and loudspeaker change not only accordingly to the distance between microphone and loudspeaker but also because of the temporal development of the kind of sound processing in the Max patch. A very appealing aspect of this set-up is in my view, is that all three microphone signals are connected to a single loudspeaker. All three players have to find their own way of playing, because they have a different type of microphone and their sound is processed in a different way, but at the same time all these different paths come together again in a small loudspeaker in a jar. In the second part of the performance the sound of the small loudspeaker is slowly also diffused through the bigger loudspeakers in the hall (the PA loudspeakers). This does not cause any noticeable change in the acoustic feedback interaction, but the spatial and spectral characteristics do change due to the different in placement, sound diffusion and spectral response of these loudspeakers. The sound of the jar itself seems to fill the whole performance space now, instead of occupying a single spot. At the end of the piece, the loudspeakers in the hall fade out again and the sound moves back into the jar. By preparing this text I also discovered that Ronald Boersen has an interactive sound installation, that uses loudspeakers and ping pong balls. I added this to the collection of fifty years of loudspeakers and ping pong balls.